I remember eating watermelon on the front steps. They were concrete, about 3 of them, rising up from the pavers that led to our house from the sidewalk, and culminating in a brief, broad stoop. Even when watermelon season rolled around, there were cool spots on the stoop: it was partially shaded most of the day, until late afternoon, by our huge twin azalea bushes (the flowers almost the same color as the fruit). Cool stoop, the cool of watermelon in my mouth, juice running down my chin. It always marked the beginning of summer, the first day my mother brought home watermelon. Sometimes she got home from the grocery store after I got home from school, but more often, she’d just finished putting away the groceries when I arrived. So the watermelon was never ice cold, but still cooling off from its trip in the car. I think even in the grocery store--- the supermarket, we always called it, whether it was Giant or Safeway, it wasn’t kept super-cool. At Safeway the watermelon was most often cut up in large-ish chunks: enough for a family of three for desert, or for one hungry child’s indulgent afternoon snack. At Giant, it was left whole, and laid out in hay in the produce aisle. Giant was always more likely to have farm fresh produce, and I imagine the watermelon came in from the Eastern Shore or Delaware early in the morning. The watermelon in suburban Washington, then, was invariably the shape of a giant pickle: long and cylindrical, green with slightly lighter green stripes. Inside, watermelon-pink flesh and black seeds. I am not sure what it’s horticultural name was, and I am quite certain it never occurred to me watermelon could be anything different. 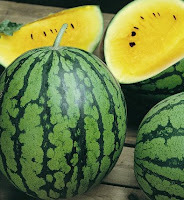 Tuesday we got our first watermelon of the season, a yellow babydoll: almost perfectly spherical with green skin and sage green stripes, and juicy, yellow, a naples yellow, flesh and black seeds. It is as refreshing as any watermelon, but with perhaps a bit more bite, a hint of spice. Maybe sesame? We ate the last of it tonight. I have eaten the most, my husband has enjoyed a few slices. Really, I’ve been sick and he’s been indulging me and my love of all thing summer, and let me eat as much and whenever I wanted it (this won’t last) and my son has had his first taste (it made him laugh). Trim the green parts from the rind. Cut rind into 1-inch cubes. Soak watermelon rind overnight in a mixture of the pickling salt and water. If it takes more to cover, use the same proportion salt to water. Drain and rinse watermelon rind. Cover rind with cold water in a large saucepan; cook just until tender. In a 6 to 8-quart kettle or Dutch oven, combine sugar, vinegar, cinnamon, whole cloves, and 1 cup water. Simmer mixture 10 minutes, then strain. Add drained watermelon rind, lemon slices, and maraschino cherries, if using. Simmer the mixture until watermelon rind is translucent. Fill hot half-pint jars with watermelon rind and syrup mixture, leaving 1/2-inch headspace. Adjust lids. Process in boiling water bath for 5 minutes.